So I’ve been wanting one of these for the LONGEST. My wife finally decided she’d get the supplies to make some and asked if I wanted any specific colors. I asked about a dark olive green and copper. The store had the first, but didn’t have copper. It did have yellow gold instead. Works for me! So I went about making my first ever paracord wristband. I named it Master Chief for obvious reasons. Yes, I MADE THIS! The know I used is called dragon’s claw. You can see that in all the pics, but I think best in the one that has the band at length below. What’s cool is that there is a different pattern on the reverse (inside here) side. So you can wear it inside out if you like. I really like the dragon’s claw look though, so I’m keeping it like that. And here’s my hairy wrist demonstrating the band being worn. Now, I know it’s not perfect. It is my first time after all….. Anyway, I did start one out but didn’t like how the knots were looking. So I untied it and started over. I used 550 Paracord with a black swivel clip.The second time around not only did this get easier but I also was getting faster and paid much more attention to the tightness of the knots. It took about 1- 1 1/2 hours to make this. That’ might seem long, but again, first time for me. 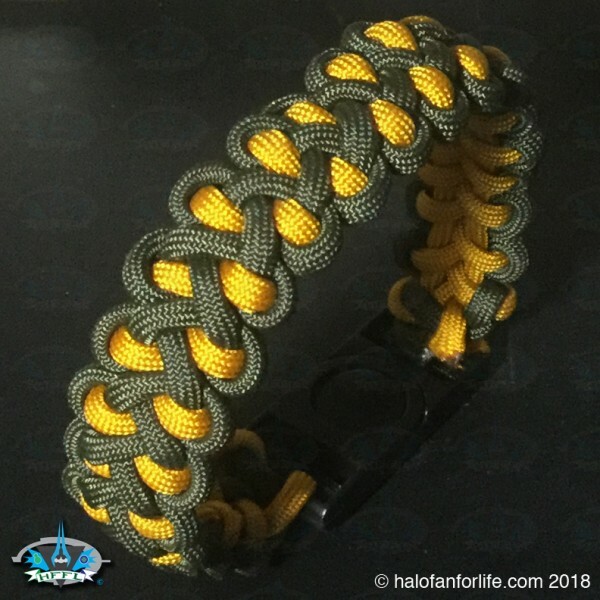 I had so much fun making this that I’m going to make more Halo themed paracord wristbands. I’ll even make them with different kinds of knots so they will be unique from one another. Hmm…might even start an etsy page for these?? I guess that will depend on demand. At any rate, I’m enjoying them for myself!